Over the last few months, the cast and crew of the upcoming Star Trek Beyond have been using their place in the public eye to raise awareness and funds for a variety of charities and causes. They’ve also used the videos as an opportunity to tease bits and pieces of the highly secretive film, and the latest is no different, as it features a quick glimpse of a new alien head. 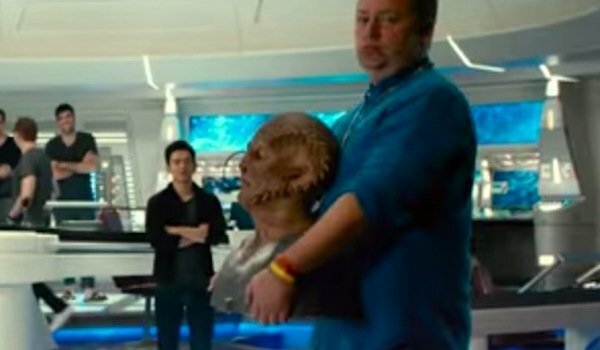 At the 1:55 mark in this latest offering, hosted by Simon Pegg and featuring all kinds of bloopers and flubbed lines from previous versions of these Omaze videos, a guy walks into the frame holding the bust of an alien race, pauses for a moment, then slowly backs out. Cards on the table, this dude looks super familiar, but I can’t for the life of me name it as something specific (if you know, holler it out in the comments, otherwise it’s going to drive me nuts). 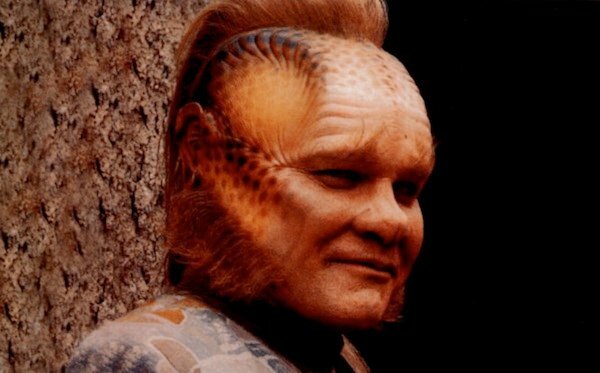 There are elements that remind me of the Talaxians, like Neelix from Star Trek: Voyager, especially the head ridge along the edges of the skull and the cheekbones. But the ears don’t look quite right, the coloring is off, and they usually have hair while this fellow is bald. It is possible this is a new race to be introduced by the rebooted franchise (again, if I’m an idiot and missing something ridiculously obvious, let me know), much like the Nibirians from Star Trek Into Darkness—we did see what appeared to be one of them pop up in that leaked set video a while back. Or it could possibly be a tweak of an already existing people. We know that Idris Elba, who figures prominently in this video, is supposed to be playing the villain, and Simon Pegg, who wrote the latest draft of the script with Doug Jung, has publicly said that Elba does not play a Klingon. Perhaps this is a hint about who the Thor actor will play. Then again, by that same logic, we could be seeing the on-screen future of new additions like Sofia Boutella, Joe Taslim, or Lydia Wilson, other new additions with characters we know little about. Whatever the case here, you should check out the whole video, it’s a pretty good time. This isn’t the first time the Justin Lin-directed Star Trek Beyond has used these Omaze videos for more than just fundraising and offering fans the chance to win all kinds of cool prizes (like a replica of Captain Kirk’s chair from the bridge of the Enterprise that smells like Chris Pine’s backside!). Before now, they’ve given us our first look at the sets, introduced us to a weird little alien, and most recently paid tribute to their friend, the late, great Leonard Nimoy. Even with all of this, we still don’t know much about the film. We know it will jump ahead a few years from the last movie and find the crew in the midst of their five-year mission. That’s something fans are excited to see, as the last two movies were largely Earth-centric. Aside from that, everything is rumor and hearsay, and much of that was even from before Simon Pegg and Doug Jung took over the writing duties and gave the script a massive overhaul. There were reports of Klingons, mysterious new female characters, and more, but now we have no idea how much of that survived the revisions. Star Trek Beyond is currently filming in Vancouver, British Columbia, and is scheduled to boldly go into movie theaters everywhere on July 8, 2016.